Mike Marshall is one of the best mandolin players in the USA today. For more than 30 years Mike has played everything possible on the mandolin, and also on the mandocello – bluegrass, dawg, jazz, classical and brazilian choro. In the early 80s he played together with the David Grisman Quintet. For the leading mandolin journal of that time – the Mandolin World News – he wrote the beginners page. With the Modern Mandolin Quartet he played classical music from the nutcracker suite to Gershwin’s West Side Story. During the last years he has learned everything about the brazilian choro and has invited the leading choro players like Hamilton de Holanda and Dudu Maia to the United States. Mike was a teacher at the first European Mandolin Acadamy held in Trossingen this year, together with Don Stiernberg, Caterina Lichtenberg and Mirko Schrader. 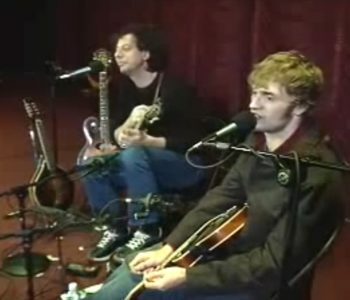 Chris Thile was very successful with the Nickel Creek. He plays is a fantastic mandolin player and is – like Mike Marshall – very versatile. He is certainly an idol for many young mandolin players in the USA and around the world. He plays the mandolin very creatively and has developed his own style and sound. Every week in an old theater in Lexington, Kentucky, there is a one hour concert organized by Michael Jonathan – the Woodsong’s Radio Hour. Those concerts are available for download as audio or video files – a huge archive of excellent music. Mike Marshall and Chris Thile played concert No. 287 – a concert that you should have seen and heard. Both are playing excellent. 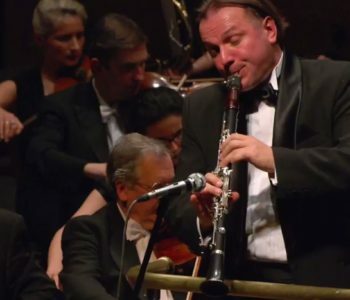 The program includes classical pieces like the Goldberg variations by J. S. Bach, standards like the Fishermans Hornpipe and many compositions by Mike Marshall and Chris Thile. The Radio Hours is just one hour, but after a short break it was continued with an after hour, a long program with many interesting pieces. In the beginning of the concert Mike and Chris each played one solo piece. Mike began with Odeon by Ernesto Nazareth, the first piece in the playlist below. If you do not want to download the complete video you can also find most of the pieces as youtube videos. However – the complete video contains also the interviews and the talk between the pieces which is also very interesting, and you learn a lot about Mike and Chris if you watch it. I have dicovered this video already some time ago, and I heard it again today. 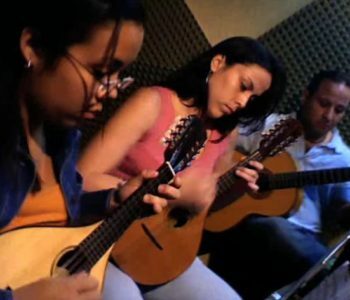 La Sexta Basica is a group composed of typical Venezuelan plucked instruments and a singer. They play a very interesting mix of traditional Venezuelan music with a modern sound. These are very good examples of how to use plucked instruments in a group with a singer. Enjoy the videos! “Pueblos tristes” original de Otilio Galindez interpretado por La Sexta Basica en Lunacreciente Studios.Caracas, Venezuela. La Sexta basica, grupo de musica venezolana contemporanea. There are several instruments in Venezuela and Columbia named bandola, the bandola llanera is the most popular of those. The bandola llanera has 4 strings – usually made from nylon like the strings of a classical guitar. It looks like a pearshaped guitar, at the first sight it looks quite strange and unusual. The instrument is played with a pick, and it sounds a little bit like a Spanish flamenco guitar. The players seem to try to play it loud, and usually do not try to produce a clean and sweet sound. But this is right for the kind of music played on the bandola llanera. This music goes back to the music of Sapin in the 16th and 17th century and has been further developed in Venezuela. Atlas of stringed instuments: The 4 nylon strings are often tuned : a d’ a’ e”. Wikipedia Stinged Instruments Tunings: A3 D4 F♯4 B3 ???? is this also used as a tuning??? Saúl Vera is one of the important players of the bandola llanera, his ensemble has existed for more than 18 years now. understanding of the instrument’s cultural value. 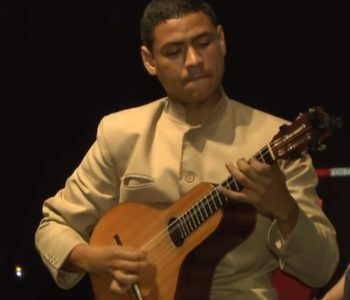 You can see that Saúl Vera is using an instrument with a special cutaway, to be able to better reach the higher frets.